7-Port USB 3 hub with +7V to 24V DC intput and metal chassis for industrial applications. Allows for 7 additional USB devices that comply with Universal Serial Bus 3.0 (USB 3.0) Specifications Revision 1.0. Uses Screw Lock USB 3.0 cables for secure connections. 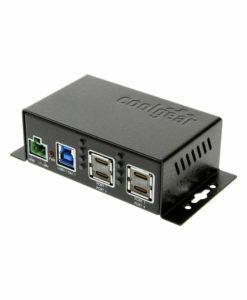 Adds 7 Downstream USB 3.0 Data Ports backward compatible with USB 2.0/1.1 speeds. The USBG-7U3ML USB 3 Hub is an Industrial 7-Port Hub that complies with the Universal Serial Bus 3.0 (USB 3.0) Specifications Revision 1.0 and is capable of up to 5Gbps. It supports voltage of +7V to 24V DC input and provides 7 downstream facing ports with standard Type-A USB 3.0 connectors. It also supports screw lock features for both upstream (USB type B) and downstream (USB type A) connectors to prevent accidental disconnection. With built-in single chip USB 3 Hub controller, this hub is backward compatible either when any one of downstream port is connected to an USB 1.1 or USB 2.0 compliant device, or when the upstream port is connected to a USB 1.1 or USB 3.0 compliant host. The USBG-7U3ML Industrial USB 3 Hub is a mountable hub that provides a unique feature to work in the bus-powered mode without an external AC power adapter. It is very convenient for light power consumption USB devices to function in this mode without the external power supply. Very pleased, it fit my needs perfectly and works flawlessly in my overlanding vehicle stuffed behind the original OEM radio location. It allows the powering up of more than two phones, a USB powered Bluetooth reciever, a 7″ Samsun tablet that removable, and And a USB charger for a Streamlight flashlight (a total of 5 devices with two extra ports and I am able to make use of one port to access with am laptop both phones as well as the tablet for file sharing on the go. Now my only problem is I think I should have ordered a 2nd one for the shear fact it’s made it possible to make use of so many USB chargeable devices, I now need one in the bed inside the topper. Currently using these in many installations on custom up fitting of client vehicles..
No problems receiving or operating this hub, works great and did include the power supply. This USB 3.0 hub is just the right size for what it was needed for. Have purchased from 8 different manufactures a powered USB hub to drive 6 GPRS/SMS USB modems. This is the first unit to not fail or intermittently provide power after a couple of weeks. I would give 5 stars if the mounting was more oriented to a data center communications rack and not a circuit breaker rack. The 7 port USB 3.0 Hub has certain accessories that work with it. These hub accessories are what you can order if needed for this hub.